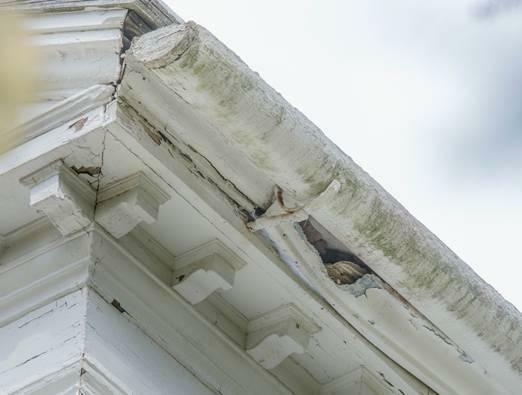 Squirrels have caused severe damage to the two-century-old Derby Summer House in Danvers. The historic Derby Summer House in Danvers, which has survived more than 220 years, is facing a threat from an unlikely source: a mischievous squirrel dubbed Nutsie. The squirrel and about 20 of its cohorts have caused severe damage to the iconic building at Glen Magna Farms. With holes chewed in the wood, water damage, and squirrel waste causing deterioration, the building is in “critical condition,” said George Saluto, a Danvers Historical Society trustee. The first signs of Nutsie’s handiwork were spotted last fall. “We noticed that in the gutter, there was a gaping hole and you could basically see into the roof,” Saluto said. He started the lengthy process of applying to renovate a historic building, but the snow arrived before the paperwork went through. Repairs had to be delayed until the spring. By then, Nutsie and the others had left a few more surprises. There were two more holes in soft wood around the building, as well as squirrel waste inside them. Water and snow had also leaked through the holes, causing some of the wood to warp and rot. Derby Summer House in Danvers. The damage was first reported by The Salem News. A consultant estimated the cost of restoration to be between $150,000 and $200,000, Saluto said. The historical society has launched a capital campaign with an initial goal of raising $2,000 to have a professional remove the squirrels and get a contractor to button up the exterior. To raise the money, the historical society is mailing letters asking people to “adopt Nutsie.” Anyone who donates $100 will receive a plush squirrel. The long-term goal of the campaign is to raise money for the restoration of the Derby Summer House, as well as the preservation of other historical society properties, Saluto said. 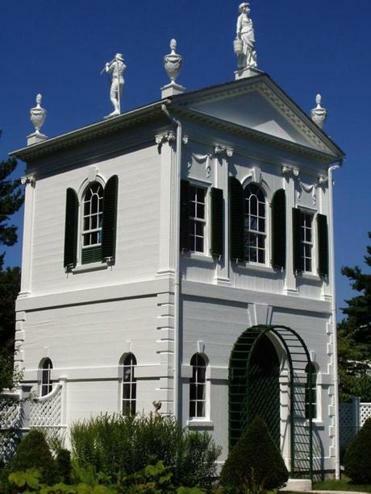 The Summer House, which has been a National Historic Landmark since 1968, was designed by home builder, cabinetmaker, and woodcarver Samuel McIntire in 1793. He made it for Elias Hasket Derby, a wealthy Salem merchant who was the first New England businessman to trade directly with Canton, China, the city now known as Guangzhou. The building, also called the McIntire Tea House, was built on Derby’s farm, but was moved to its present location at Glen Magna Farms in 1901. It was built so well that not even the plaster cracked during the move, according to the historical society’s website. The house was bequeathed to the Danvers Historical Society in 1958.